Basic 3: Coffee and Tea - Do You Know The Muffin Man? We started this morning with muffins. I've probably made at least 100 dozen muffins in the past so I didn't think this was going to be too hard. After mixing everything together, we let the batter rest for a while to let the bran hydrate. Dissolving brown sugar in the water/egg mixture first ensures that it will blend evenly in the batter since very little stirring is needed. To create yet another item to wash, we piped the batter into the tins instead of scooping it. Heh, our instructor said that when he was in school, they were docked marks if any of the batter was dropped on the top of the tins. Oh, another thing which I never do at home is spray the tins (which were already lined with paper cups) with PAM. 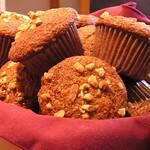 When they came out of the oven, we took the muffins out of the tins so they wouldn't “sweat”. Update: I've posted the recipe at the request of a reader. Next up were scones. It started out like pie dough, using our hands to cut the shortening into the flour, but with a more mealy texture. With the added liquid, the dough was very tacky. After letting it rest, we rolled it out and let it relax by lifting it off the table. The dough was cut into rounds and we applied an eggwash before baking. 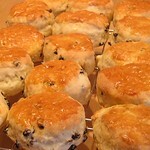 The scones were very tasty, tender and moist. A variation our instructor suggested was making these with rosemary, basil, cheese, etc. and using less sugar.